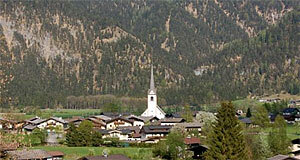 St. Martin is a village in Saalachtal of the Pinzgau area in Salzburg. It has a total population of approximately 1,100. Since it has two namesakes within the Salzburg province (one St. Martin am Tennengebirge and a hamlet that is no municipality, but known), the name is usually refined by adding "bei Lofer" - indicating the vicinity to the big neighbour. St. Martin is good for hiking, skiing is decent at the nearby Loferer Alm skiing area. In the early Middle Ages, the region around Lofer was part of Bavaria. In 1228, the Pinzgau was acquired by the Prince Archbishop of Salzburg, which lost its independence in the Napoleonic Wars and became Austrian in 1816. St. Martin was made a municipality in 1850; after the Anschluss in 1938, it was merged with Lofer. However, after WWII the next municipal reform took place and Lofer was divided into Lofer, St. Martin and Weißbach in 1946. For sightseeing, note the Baroque church of pilgrimage Maria Kirchenthal. It was built above St. Martin according to designs by the Baroque super-star among Austria′s architects, Johann Bernhard Fischer von Erlach. He lived in the 18th century and served the Prince Archbishop of Salzburg for a couple of years. The church was built between 1694 and 1701; it is the most striking landmark of St. Martin bei Lofer today. Note also the parish church of the village. For hiking and outdoor attractions, have a look at the Strohwollner Schlucht, an impressive river gorge, or the Vorderkaserklamm (another gorge). The Prax-Eishöhle is an ice cave near St. Martin. The artist Anton Faistauer was born in St. Martin in 1887.